Judges have praised schemes that put community engagement at the centre of local decision making, as two community transport initiatives in Sevenoaks were chosen as best reflecting what local people really want from transport schemes in the UK. The Sevenoaks Town Partnership vintage bus service and the Sevenoaks Route 8 bus service have been awarded top prize in the Transport Planning Society’s inaugural People’s Award for 2018. Judges also praised as ‘highly commended’ the Loch Earn Railway Path, a previously non-existent off-road link between Comrie and St Fillans in Perthshire. The People’s Award, launched earlier this year, showcases transport planning initiatives that have made a significant difference to local people. The Transport Planning Society invited communities from across the UK to nominate projects that had put local engagement at the forefront in the planning and delivery of schemes. The winners were announced at the annual Transport Planning Day, hosted by the Institution of Civil Engineers (ICE) in London, which brought together transport planners and community groups for a discussion about best practice in community engagement in transport planning and what transport planners should look to in developing local schemes. Keynote speaker for the event was Lilian Greenwood MP, chair of the transport select committee, who delivered an evening lecture. The competitive judging process was led by Stephen Joseph, a former chief executive of the Campaign for Better Transport. The panel looked at community schemes that had made a real difference to people’s access to services, quality of life and wellbeing. The Sevenoaks Town Partnership Vintage Bus Service was launched in 2011 as a partnership between Sevenoaks Town Council and the local community. Operating during the summer and now in its sixth year, it has helped contribute to a boon in visitor numbers to businesses in the town centre and the leading National Trust property at Knole. Such is the popularity of the service, local residents also use the bus route often, instead of travelling by car. Older people say they can now visit it the town independently rather than waiting for a relative to collect them and take them shopping. The introduction of the Sevenoaks Route 8 Bus Service, an orbital bus route linking Sevenoaks town centre to residential areas, (pictured above) has seen the town council providing free bus travel to young people aged 11 to 18. Older passengers say they find the bus a social experience meeting the same neighbours and conversing with the bus driver and helps sometimes with loneliness experiences. 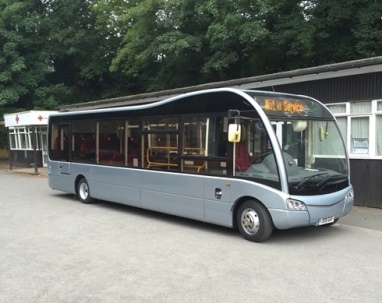 Attracting nearly 500 passengers per week, the bus operates six days per week, linking the two train stations, bus station, residential areas and town centre.